What are the limits of our copyright? Recently, we have had several questions regarding the limits of our copyright—for both our Classic modules and our E-learning courses. To help clarify the restrictions, here are the answers to those frequently asked copyright questions. Our organization just purchased a number of your Classic topics in PDF format. How can we use them without violating your copyright? A copyright date, which is the year of publication. An expiration date, which is two years from the date of publication. This topic may be copied for use within each physical location that purchases this inservice from In the Know. All other copying or distribution is strictly prohibited, including sharing between multiple locations and/or uploading the file or any portion thereof to the internet or to an LMS (unless a license to do so is obtained from In the Know). In accordance with industry standards, this inservice material expires on (the listed expiration date). After that date, you may purchase a current copy of the materials by calling 877-809-5515. This means that our copyrighted materials are for use within your specific (employment) location only. You may print each inservice you purchase as often as desired, until it expires, for utilization with the employees for your location only. Once we print the “learner’s section” of an inservice, can we send it home with our nurse aides? Yes! As long as your state allows self-study for nurse aides, you may distribute the learner’s section for your employees to take home. It serves as a great review for them in the future, too! The PDFs we purchased from you are “locked.” Can we get unlocked versions so we can add our logo? Sorry, no. Please note that it violates our copyright to alter the document in any way. If you would like your logo added to the cover of the inservice, we can do that for you for a fee. Our organization has several locations. Can each location buy a few topics and then share them? Our copyright states that inservices may be used only within each physical location that purchases the module. So, no, it violates our copyright to distribute topics outside your specific physical workplace. We do offer discounts for organizations that would like to use our inservices in multiple locations. If you would like to find out your potential discount, please call our main office at 877-809-5515 and ask for Maria Easton. You may also email Maria at mariaeaston@knowingmore.com. Can we add the PDF version of your inservices to our company intranet? Yes, you may, as long as you comply with our copyright. If your intranet serves nurse aides in multiple locations, you will need to purchase the topics for each location. For example, ABC Healthcare has a company intranet that is utilized by employees in 20 locations in three states. They would need to make a multi-site purchase for their 20 locations before adding the topics to their intranet. In addition, please note that any topics added to an intranet MUST be secured by a password. Our IT specialists make random checks to make sure that our topics are not accessible by the general public. We run a private school that offers training for certified nursing assistants. Can we purchase your Classic modules and then resell them to our students? Sorry, but at this time, we do not offer a reseller program for our Classic or E-learning modules. What is your new In the Know On the Go program all about? Great question! 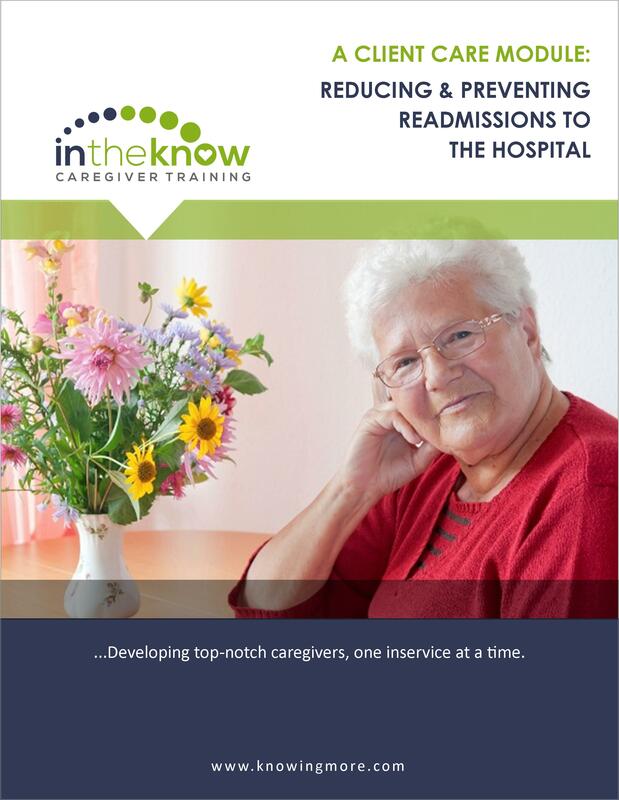 With In the Know On the Go, we offer healthcare organizations a way to provide continuing education to all their nurse aides using the power of the internet. Simply purchase the number of seats you need for your caregivers and they’ll have access to our complete library of engaging, interactive online modules! ITK on the Go is mobile-friendly, too, so your nurse aides can complete their CEs on a computer, a tablet or a smart phone. I am the administrator of a nursing home. I just purchased the “Online Self-Study for an Individual CNA Only” version of one of your e-learning modules. Can I use it with all my CNAs? Sorry, no. The “Online Self-Study” version is intended for use by an individual nursing assistant. Using it with all your CNAs is a violation of our copyright. Instead, please contact us about our new ITK on the Go program. As a supervisor of just two aides, can I purchase individual e-learning courses for them? Yes! Actually, with only two aides, it would be cheaper for you to purchase two copies of the “Online Self-Study” courses rather than the minimum ten seats for our new ITK on the Go program. However, please note that the name of the person who purchases the inservices will be the name on the certificate of completion. If you need help adjusting the name on the certificates, please call our offices at 877-809-5515.